STIHL’s AP line offers one of the most extensive range of commercial-grade battery electric equipment in the world. All equipment in the table below are of excellent quality and performance, and all are AGZA Approved. Since run-times and recharge times are among the most critical challenges for full-time commercial operations, AGZA recommends (yellow highlighter) the most powerful handheld battery (AP300S) and backpack battery (AR3000), and the two fastest chargers (AL300 and AL500). NOTE: Must be used with battery belt or AR-style backpack battery and required adapters. The Lithium-Ion battery-powered BGA100 is built with the professional landscaper in mind. When in boost mode, the BGA100 is the most powerful dedicated handheld blower in the STIHL range. This Lithium-Ion battery-powered blower boasts higher quality and better ergonomics than many other battery products on the market, and delivers performance superior to many gas powered models. The new BGA100 design shifts the battery weight from the unit to the back or hip with a high-performance cable connecting system. This results in a lighter blower and reduces user fatigue. The BGA100 features four performance levels through a variable speed throttle trigger delivering an even balance of blowing power and run time. Its rear-mounted air intake allows the blower to be used right- or left-handed. The quietest and lightest blower in the STIHL lineup, the BGA100 allows you to clean up with ease around neighborhoods, urban areas, or other noise-sensitive zones. * NOTE: Runtimes vary by work conditions and throttle usage. No gas. No cord. No emissions and almost no weight. The STIHL BGA85 handheld blower features a powerful 36-volt, lithium-ion battery for excellent blowing power that is quiet, clean, and best of all, cordless. This lightweight blower is extremely compact, weighing a mere 7 lbs. without battery, yet it delivers over 100 mph of air to move stubborn yard debris. And don’t expect any gradual power drops – this blower will run at full speed until it’s time to recharge. An ideal blower for use around the home. Imagine a summer breeze carrying the scent of freshly trimmed grass through the air. There’s a quiet buzz in the near distance. No fumes. No emissions. No disruptions to the peacefulness of the day. 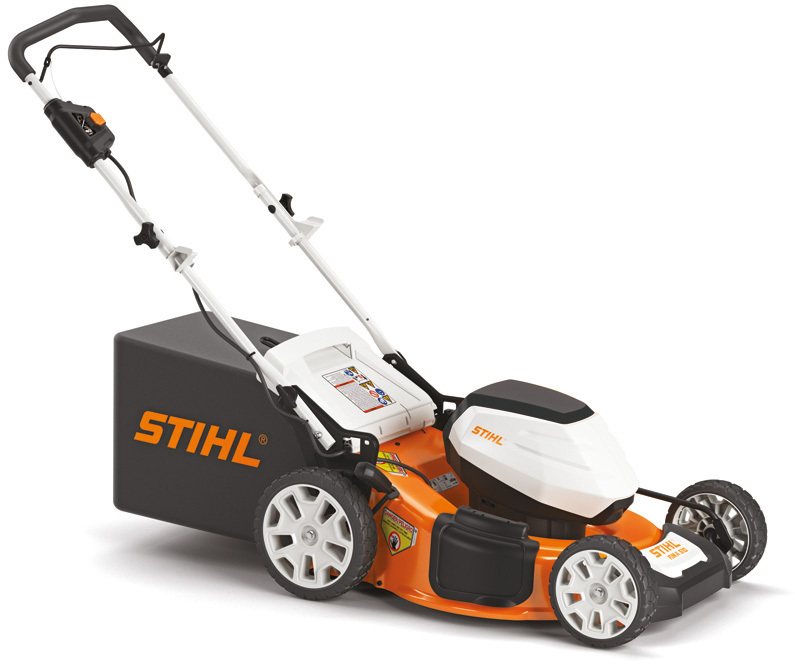 You’ve just witnessed the STIHL FSA130R AP Series battery-powered trimmer hard at work. Professional landscaping crews can now count on the same durability of its gasoline-powered counterpart in a battery-powered trimmer. The FSA130R’s quiet operation allows crews the flexibility of extended working hours during early mornings, evenings and beyond. With instant starts, a large 16.5” cutting width and a commercial-grade brushless electric motor for optimal performance and durability, the FSA130R is a powerhouse of convenience features. Plus, its variable speed throttle trigger offers three performance levels, allowing users versatility in selecting the best operation speed for the job at hand, conserving battery energy and allowing maximum run times. The external battery connection shifts the battery weight from the unit to the user’s back for a lightweight, well-balanced, fatigue-reducing trimmer. Whether you’re a professional operator of the FSA130R – or a passerby by happenstance – everyone will enjoy the benefits of the FSA130R battery-powered trimmer from STIHL. The STIHL HSA66 Lithium-Ion hedge trimmer features a 36-volt lithium-ion battery and delivers strong, quiet cutting performance. Another tool in the STIHL Battery-Powered Equipment line, the HSA66 runs on the same universal battery shared by all battery-powered tools. Its energy-efficient design allows for up to 40% longer run times when compared to the previous model. And as always, there’s no gradual drop in performance – it runs at full power until the battery is fully depleted. The HSA66 is also a full pound lighter than the previous model, making it less fatiguing and easier to maneuver for landscaping professionals. And because there is no gasoline, no fuel cost, and no restrictive power cords, the HSA66 delivers an excellent combination of performance and efficiency. The STIHL HSA66 also has no exhaust emissions and is four times quieter than its gasoline-powered equivalent, making it an excellent alternative in environmentally sensitive areas. The HSA66 features optimized blade geometry and diamond-ground blade edges for clean cuts, even through thick and tough shrubbery. The 20” blade length is an efficient working length for most applications and a tip protector helps protect blade tip from damage. The HSA66 lithium-ion hedge trimmer is a great choice for professionals interested in both controlled sculpting and general hedge trimming tasks. The HSA94R and HSA94T are ideal for professionals looking for lightweight, quality and precision performance. Featuring commercial-grade, brushless electric motors, these energy-efficient and lightweight hedge trimmers are quiet and deliver ideal speed and run times. The ergonomic handle on both tools is ideal for making cuts in any direction, allowing for efficient and comfortable use. They require no onboard battery. Rather, a variety of options are available that allow the operator to shift the battery weight to the back or hips for optimal weight distribution and user comfort. HSA94R (above). Designed with high torque, low blade speed and wide tooth spacing ideal for making powerful pruning cuts. The HSA94R also has instant start technology and features a variable speed throttle trigger with three performance levels offering cutting speeds ranging from 2,800 to 3,200 strokes per minute. HSA94T (above). Designed with higher blade speed, smaller tooth spacing and lower tooth height as compared to the HSA94R model, the HSA94T is ideal for trimming hedges quickly and minimizes fraying of the cut edge for fine applications like precision sculpting. This hedge trimmer also has instant start technology and features a variable speed throttle trigger with three performance levels offering cutting speeds ranging from 4,400 to 5,000 strokes per minute. Looking for trimming versatility? Check out STIHL’s HLA65 and HLA85 lithium-ion extended reach hedge trimmers. These tools are lightweight and easy to maneuver in hard-to-reach places. Their quiet motor produces zero exhaust emissions – excellent tools for working in noise-restricted or environmentally sensitive areas. Best of all, there’s no gasoline cost and no restrictive power cords. Both tools deliver on cutting performance, featuring specialized blade geometry and diamond-ground blade edges for clean cuts, even through thick and tough shrubbery. The 20-inch blade length is an efficient working length for most applications, and the tip protector helps protect blade tips from damage. The HLA65 and HLA85 offer long run times — up to 13 hours with the AR3000 backpack battery! — with no gradual drop in performance. They feature variable speed throttle triggers, offering optimal cut control. The HLA85 is equipped with an articulating gearbox (-45° to 70°), for cutting the tops of hedges and near the ground. The HLA65 features six different locking positions, giving professionals a 105-degree operating range. Both cutter bars are adjustable and foldable and include an automatic blade stop when folded. Eliminate fuel costs and get the convenience of Lithium-Ion technology with these battery-powered pole saws. The HTA65 is a fixed length, low-maintenance and environmentally responsible pole pruner option for professionals and homeowners alike. Running on an advanced 36-volt Lithium-Ion battery, the HTA65 eliminates the need for fuel and two-cycle oil, and considerably reduces maintenance needs. It offers users low noise and lower vibration levels than its gas-powered equivalents, as well as automatic chain oiling and increased portability, making it the perfect pruner for many tree care needs. The HTA85 is a quiet, zero-exhaust emission, low vibration option for trimming overhead branches for homeowners and tree care professionals. The HTA85 offers lightweight, balanced cutting thanks to its brushless, commercial-grade, high-torque electric motor. It offers long run times – up to three hours with the AP300 battery – without gradual drop in performance. The HTA85 telescopes to 12 feet for those tall tree-trimming tasks and requires minimal maintenance since it has no engine or filter. Best of all, there’s no gasoline cost and no restrictive power cords. MSA160 (above). Now here’s a game changer in chainsaws. Lightweight. Powerful. Easy to start. Quiet. With no mixing. No cords. And almost no sound. (Your neighbors will love this saw as much as you do.) The MSA 160 C-BQ is powered by a Lithium-Ion battery. This little workhorse starts instantly, delivering 36 volts of power from its commercial-grade, high-torque brushless motor. Enough power to take on just about any cutting job in your yard. And the Quick Chain Adjuster allows you to adjust the chain tension without tools for added convenience. MSA200 (above). No pulling on cords, fuel mixing or complicated startup procedures. With the MSA 200 C-BQ chainsaw, just squeeze the trigger and start cutting. In addition to easy starting, our battery powered tools produce zero exhaust emissions and are quieter than their gasoline-powered counterparts, making them an ideal choice for areas with emission or noise restrictions. Powered by an interchangeable STIHL Lithium-Ion battery, this chainsaw delivers the speed, cutting capacity, and run time to take on just about any cutting job on your property. The STIHL MSA 200 C-BQ is a cordless chainsaw tough enough to carry the name STIHL. = 1 3/8" to 3 3/4"
* NOTE: Area mowed vary based on working conditions. Professionals get gasoline-powered performance and runtimes from their STIHL Battery-Powered Equipment with the AR1000, AR2000, and AR3000 battery backpack. These three backpack batteries each deliver exceptional run times to professional landscapers and eliminates the cost of fuel and engine oil. The backpack battery has a built-in USB port, which allows users to charge their electronic devices when the backpack battery is not in use. It’s also smart, with built-in sensors and microprocessors that monitor temperature and automatically shuts down the battery to avoid overheating. And as with all 36-volt STIHL Lithium-Ion batteries, there is no battery memory limitation, no gradual drop in power and it runs at full speed until the battery is depleted. The backpack battery is also designed with comfort in mind, including an ergonomic hip belt and chest strap that evenly distribute its weight. And in light rain, use the included removable rain cover to power through the task at hand. Eliminate exhaust emissions, fuel and oil costs, reduce noise, and increase productivity and profitability with the most powerful batteries in the STIHL line. Recharging the AR3000 to 100% capacity with the AL500 High-Speed Charger takes only 2hrs — five times faster than many other backpack batteries on the market. The STIHL AP100 Lithium-Ion battery weighs in at just 1.8 pounds, but delivers heavyweight performance. Use it across multiple STIHL battery-powered products with no gradual drop in performance. And thanks to its LED charge display, you’ll know how much power you have while you work. The AP 100 is also designed for long service life – it can be charged hundreds of times without any noticeable loss in capacity. Even after 500 charges, the battery retains over 80% capacity. And like all STIHL batteries, the AP100 features an onboard circuit board to monitor voltage and temperature, helping deliver smooth performance and tool safety. The redesigned AP300 battery from STIHL is the answer for professionals who need a water-resistant battery, long-lasting power and a good power-to-weight ratio to get the job done. Outdoor work on rainy or wet days is less problematic with the battery’s new casing, which provides water resistance*. The AP300 connects to multiple tools, including extended-reach hedge trimmers, pole pruners, chainsaws and blowers, and weighs in at just 3.8 pounds. This high-performance battery runs at full speed until the battery is depleted – there is no gradual drop in power. Plus, it retains up to 80 percent of its power, even after 1,200 charging cycles. Greater battery capacity to cover your needs for the bigger jobs, is offered by the AP300S Lithium-Ion Battery from STIHL. The AP300S features a 25 percent increase in battery capacity over the AP 300, equaling up to 25 percent longer run time, as well as an enhanced power-to-weight ratio and a weight of only 3.9 pounds. Water resistant*, the AP300S is compatible with a wide range of tools, including extended-reach hedge trimmers, pole pruners, chainsaws and blowers. Knock out tasks like storm cleanup faster with the professional-level performance of the AP300S battery from STIHL. * When paired with tool suitable for wet or rainy conditions.